Principle: When the rubber bung was being whirled in a circle, it was performing circular motion. When a body performs circular motion, it requires a net force towards the center to give the centripetal acceleration that causes the change of direction of the body. This net force towards the center is called centripetal force. The centripetal force acting on the rubber bung was provided by the tension of the nylon string. The nylon string was attached to a number of screw nuts of known mass. The tension in the nylon string can be vary by change the number of screw nuts in the system. Results of using different lengths (L) of nylon string in the experiment. The value of tension calculates from my experiment result and the value of tension in the nylon string are very close together. It is a reasonable value. It implied that the frictional force and human error were not too large. The frictional force was neglected. The mass of the nylon string was neglected. The nylon string was assumed to be inextensible. The orbit was assumed to be exactly horizontal circular motion. The angular velocity of the rubber bung was assumed to be constant. 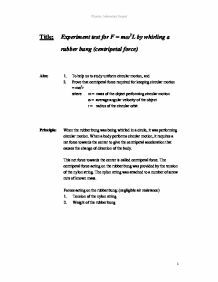 This experiment requires 2 students to do. Otherwise, if we use one hand to hold the glass tube and whirl the rubber bung, the other hand use the stopwatch. It was very difficult to hold the glass tube stably, count the number of revolution accurately and press the stopwatch immediately after the rubber bung complete 50 circles. the angular velocity of the rubber bung.The rubber bung was whirled at a very high angular velocity. It was very difficult to count the number of revolution. Therefore, the rubber bung may not be whirled for exactly 50 revolutions.L, M and m may not be measured very accurately.The zero error of the metre rule.Random error.The reaction time of press the stopwatch. Use a nylon string that the force constant is much larger. Whirl the rubber bung at a constant angular velocity so that the centripetal force requires for do the circular motion is constant. Do the experiment carefully and ask a partner to see whether the rubber bung is doing a circular motion. Provide a constant force to the system to overcome the frictional force and catch the glass tube stably. Use a glass rod that has a smooth edge and a rubber bung that has a streamline shape. Use a larger L to do the experiment. If the angular velocity was decreased, it would be much easier to see the rubber bung and easier to count the number of revolution. Measure those values many times and take the mean of all results. Use a new metre rule. Do the experiment many times to reduce the random error. Raise the number of revolution from 50 to 100 to reduce the percentage error of using the stopwatch. The centripetal force apparatus are constructed as shown above. 3. A length of 1m of the nylon string is measured from the rubber bund to the glass tube. 4. The length L of the string is marked with the paper marker. Besides, there maybe counting errors of the number of revolutions of the circular orbits made by the rubber bung. To improve the experiment, we can close the windows and turn off the fan to ensure there almost no wind to influence the result. and mass of bung/weights (due to wind). Systematic errors include measuring mass of bung/weights (due to inacurracy of balance). Limitation of Appartus 1. There is friction between glass tube and the string. 2. The string is extensible. 3. Air resistance cannot be avoided Suggestions for Improvements 1. Then the spring balance was connected to them by rubber band. The spring balance was pulled to set the system moving at a constant speed. The applied force () from the spring balance was recorded. 12. Repeat steps 12 and 13 for 3 blocks and 4 blocks. Divide the result by three. 13. Repeat the process above twice and continue to step 14. 14. Calculate the average of the three results. 15. Repeat the procedure with a second bob attached at the end of the string. Pick out a position for the first coffee cup filter to fall from. 3. Place the coffee cup at that time and measure the time it takes for the coffee cup filter to touch the ground. 4. Repeat steps 1-3 two more times.